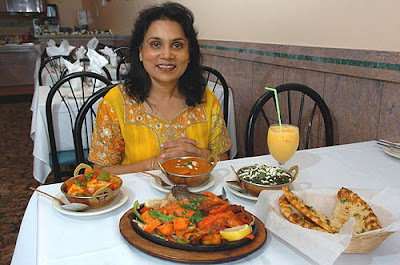 Zaiaka's owner, Meena Kumar, learned Indian cooking from her mother and dreamed of opening her own restaurant. The Indian tradition of hospitality dates back thousands of years, with guests ranking in importance only after one's parents and gurus. In many ways, dining at Zaiaka is like being an honored guest in owner Meena Kumar's home, not least because Kumar had no restaurant training or experience before opening Zaiaka about 15 months ago. Kumar, who grew up in Patna, learned to cook the traditional foods of this Northern Indian city from her mother and dreamed of one day opening a restaurant. Today she treats her customers at her Plum restaurant with a warmth and personalized attention that could serve as a model for restaurateurs anywhere. Despite the unprepossessing background. True hospitality in any setting is a priceless commodity. Kumar's sweet voice, her welcoming smile, and the care with which she settles her guests into their seats is appreciated by all. Zaiaka offers some of the most authentic and delicious Northern Indian food I have had the pleasure of sampling, whether it is compared to restaurants in Pittsburgh, New York or London.